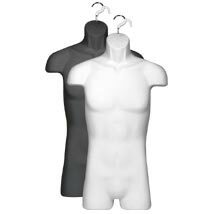 Half Round Mens Form is shaped to sell your apparel with style! Premium hard shell half round fashion forms include metal hook for easy hanging. Our half round forms feature a hollow back for easy styling. Hook is removable.